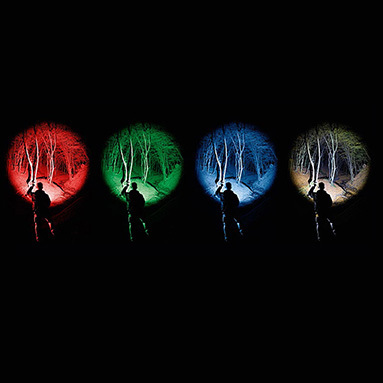 LED Lenser P7QC Quad Colour LED torch offers 4 different light output colours at the rotation of a switch making it ideal for a wide range of applications. White Light - ideal for everyday use. Green Light - ideal for observing wildlife or hunting, as animals cannot see green light and are therefore not disturbed by it. Red Light - ideal for maintaining vision at night. 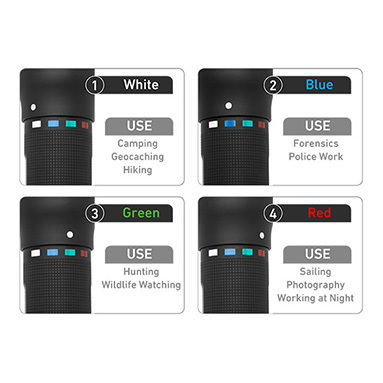 Useful for: hunters, anglers, pilots, emergency services and more. Blue Light - ideal for police and security work as blue light makes bodily fluids like sweat and blood appear black.